The Oak Ridge Civic Music Association - home of the Oak Ridge Symphony Orchestra, Chorus and Chamber Music Series - continues its 74th season, Distinctly Oak Ridge, with concerts and events from February through April, 2019. “Oak Ridge and Oak Ridgers are unique, and ORCMA’s concerts must meet a standard of excellence and innovation for both long-time listeners and new listeners,” says Music Director Dan Allcott. 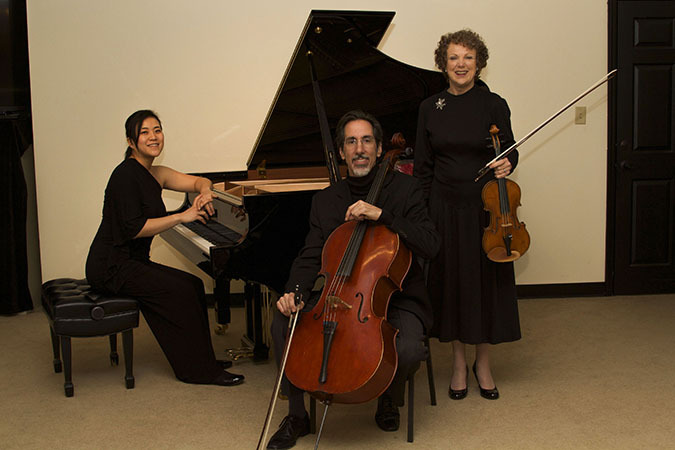 Allcott’s Cumberland Piano Trio performs at 7:30 PM, February 9, 2019, at Oak Ridge Unitarian Universalist Church, and will introduce the audience to innovative carbon fiber string instruments. “The term ‘innovative’ is often used too loosely,” says Executive Director Lisa Muci Eckhoff, “but as we learn more and more about the demand for carbon fiber musical instruments, we begin to understand how truly innovative they are. Anyone with a love of science, music, and the environment will be fascinated by this concert. We’re thrilled to feature instruments provided by Oak Ridge-based company, Pulcir Music, and to host Amit Naskar, Senior Researcher and Leader of the Carbon & Composites Group at the Oak Ridge National Laboratory, who will join the musicians in the pre-concert talk at 7:00 PM.” The trio will perform music by Dmitri Shostakovich, David Baker, and Antonín Dvořák. Adult general admission to the concert is $25. Carbon Fiber Pairings is a student-friendly pre-concert dinner with taco bar and carbon-ated beverages, and attendees will have the opportunity to touch and “try” the carbon fiber instruments from 5:30–6:45 PM. Adults $20. Youth 18 & Under attend all activities free. Sponsor a student for $10. On February 16, 2019, the all-day music festival from Rock to Bach returns. Held at the Oak Ridge Unitarian Universalist Church, this fun, fundraising event treats attendees to multiple genres of live music performed on two stages throughout the day. “Doors open at 10:00 AM, and Kelle Jolly kicks off the morning performances at 10:30,” said ORCMA volunteer and event planner Lois McKeever. “Lunch and snacks will be available for purchase onsite, and a silent auction runs from 10:30 AM until 6:00 PM. All proceeds support the Oak Ridge Civic Music Association.” Adult tickets are $12 in advance; $15 at the door. A Family ticket is available for $30. Children 5-18 years are $5; and children under 5 years attend free. Call 865-483-5569 by February 14th to RSVP for the $50 catered Celebration Dinner with wine, hors d’oeuvres and entertainment by Indus Tennessee. “The Big Galut(e) Klezmer Ensemble is a group we’ve wanted to present in Oak Ridge for quite some time,” said Bill Schwenterly, Chairperson of the Chamber Music Series, unique to the greater East Tennessee region. “The five-member ensemble will wow listeners with spice and variety, and will share insights into the history of Klezmer music and its instrumentation during the 7:00 PM pre-concert talk and throughout the performance.” The ensemble performs on March 16, 2019, 7:30 PM at Pollard Auditorium. “Something new is always being created in Oak Ridge,” said Music Director Dan Allcott, “and the Oak Ridge Symphony Orchestra & Chorus capture this spirit with a regional premier of Lucas Richman’s Symphony: This Will Be Our Reply, on March 30, 2019, at Oak Ridge High School Performing Arts Center.” The piece is “a call to heal the world,” described Richman, and is based on Leonard Bernstein's speech "An Artist's Response to Violence.” It will be sung in Hebrew. Anyone interested in joining the Oak Ridge Chorus is invited to contact the ORCMA office at 483-5569 or via email at office@orcma.org. All are welcome. Eroica, Beethoven’s Symphony No. 3, will conclude this thought-provoking program. Music Director Dan Allcott will speak about the concert on Monday, March 25, 4:00 PM. Contact the ORICL office at 865-481-8222 for more information. Watch for details on a concert-themed event prior to the concert. The Oak Ridge Chorus presents its final concert of the season, Bach to Broadway, on April 13, 2019, 7:30 PM at Oak Ridge Unitarian Universalist Church. Two intermissions, wine, and hors d'oeuvres complement the silent auction, with proceeds benefiting ORCMA. “Always an enjoyable evening, the chorus will delight you with Jesu, meine Freude and then Broadway tunes. This concert clearly shows the versatility of our volunteer Oak Ridge Chorus!” said Chorus Director Jaclyn Johnson. Adult tickets are $15. Music Director Allcott rounds out the 2018–2019 season with Chamber Delights & Dances, featuring Oak Ridge Symphony Orchestra Concertmaster Karen Kartal and Principal Oboist Ayca Yayman in solo spotlights. The delightful concert on April 27, 2019, 7:30 PM at First United Methodist Church of Oak Ridge concludes with a year-end reception with the musicians. The Oak Ridge Civic Music Association gratefully acknowledges its audience members, volunteers, advertisers, venues, contributors,and sponsors, including the Tennessee Arts Commission, WUOT FM 91.9, Oak Ridge National Laboratory/UT-Battelle, Mr. James Rome, and the Feldman Family. ORCMA is a participant in the Penny4Arts initiative, enabling Youth 18 and under to attend all ORCMA concerts for free during the 2018–2019 season. Unless stated otherwise, adult concert admission is $25. More information and tickets are available at ORCMA.org, 865-483-5569 or office@orcma.org.